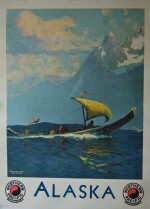 Vintage posters in our collection are original. That is they come from the original printing of the poster, in some cases over 100 years ago. Poster art is a form of advertising; between 1890 and 1945 it was the primary form of advertising throughout the world. Capitalizing on the beauty and quality of stone lithography printing, poster art fostered a cadre of great artists and graphic designers, a group we call the “Dream Makers”. For selling dreams was the object of the exercise, capturing the customer’s interest with a moment’s glance and then leaving the impression with them so that they would return, time and again to that dream, whether it be a product, a location, or an idea. Those images still captivate today as poster collecting is thriving with posters routinely selling for thousands even tens of thousands of dollars. Vintage posters are original posters. They come from the original print run with many of those posters surviving to this day being overruns, or copies printed but never issued. Printing has never been a economic process, meaning more copies are always printed than necessary. One never knows when additional copies will be needed, so a normal print run exceeded what was initially planned for distribution. Those never distributed ended up in warehouses, or company storage where they were discovered decades later. The other source of vintage posters is from collections, as we’ll discover shortly, poster collecting is almost as old as the poster itself. The poster as at art form began in the late 1800’s, in Paris, when Impressionism was the controversial art form of the day. France was in a period of relative peace and prosperity that fostered an era of positive feelings that became known as the Belle Époque, or Beautiful Era. New art forms including Art Nouveau and Expressionism found form in the Belle Époque. It was in this period that posters, which previously were dominated by newsprint, turned to art as a means of capturing one’s interest. It was also the period of advanced mass transportation and the great train and metro stations where people congregated on their way to daily business. It was in this era that two people, key to the advancement of collecting poster art, came to the forefront. The first was Jules Cheret, a French artist and lithographer. The technology of stone lithography was also key to the burgeoning poster art form as it allowed for high quality separation printing, where each color was printed one at a time, producing rich coloration and consistency in each copy produced. Jules Cheret produced many posters of his own design, but it was his Maîtres de L’Affiche (Masters of the Poster) subscription series that was instrumental in advancing posters from just an advertising medium to one of collectible art. The Maîtres ran for five years, starting in 1895, and subscribers received four small sized posters every month. Based on popular posters of the day they included works by Toulouse Lautrec, Steinlen, Mucha, Privat-Livemont, Cheret and others, and over 250 images were produced. 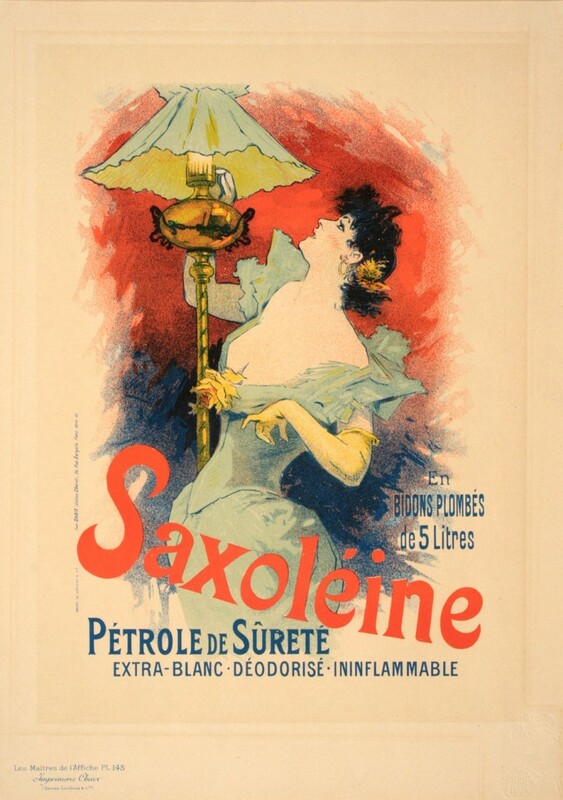 Maîtres de L’Affiche images remain popular to this day and we feature them regularly. The second figure was a young German, Hans Sachs, who became fascinated with the new art form in the early part of the 20th century. Ultimately his collection reached over 12,000 posters. His passion with posters led to the publishing of a monthly journal devoted to posters called “Das Plakat “ (The Poster). Published from 1910 to 1921, the magazine had an international following and furthered the poster collecting passion. Hans Sachs, by now a dentist, saw his beloved collection confiscated by the Nazi’s on Kristallnacht, and was forced to flee to America, aided in large part by his good friend and patient, Albert Einstein. Thought lost during the war, some of his posters were discovered, by his son, in a museum in what was once East Berlin. After years of legal battles, his family regained possession of the posters and many have recently come to auction. Dr. Sachs was meticulous in his record keeping, and these posters still carry the bookplate, on the reverse, identifying the poster to his collection. We’re proud to hold several of Dr. Sachs posters in our personal collection and occasionally offer others for sale. Jules Cheret and Dr. Hans Sachs energized the poster collecting community and that was instrumental in keeping the art alive because those who produced posters did not see their work as collectible art. To those who produced posters, it was and remains to this day, advertising. The period between the two wars was a tumultuous time. What started as the Roaring 20’s ended in global depression and another war. An economy that started with an unbridled growth in business ended with infrastructure projects undertaken by government to provide people with work after the 1929 collapse of the stock market. The infrastructure projects developed new travel and tourism opportunities and funded, at least in America, a whole team of artists to advertise them. Improvements in technology, like electric and diesel powered trains, and the modernization of the automobile created new advertising campaigns. Finally, from 1920-1940 there were 56 expositions and World’s Fairs. These cultural, industrial, and governmental events provided unlimited opportunities for advertising and poster art. This period saw the emergence of poster artists, those who created art for use in posters, expand dramatically giving us a host of great artistic talent that was unhindered in pushing the envelope of what was accepted. Names like Cassandre, Broders, Cappiello, Kauffer, Binder, Hohlwein and others created poster art that endures to this day. Mass transportation ruled this period as everywhere people travelled by train or ship to visit friends, take vacations or explore the world. These were the last days of Empire, so the English still travelled the world in support of the Commonwealth. Within Europe, outings were popular, so the mass transit companies in places like London, Paris and Berlin, promoted trips to the country, to the zoos and to the parks. After all, their trains and busses sat idle on weekends and there wasn’t much to do at home, so getting the masses out on a day trip served everyone. In America, railroad companies, like the Pennsylvania and New York Central competed for passenger service advertising high-speed trains and modern technology. Out west, the Southern Pacific and Northern Pacific promoted the beautiful parts of the country they served. World War II changed the world in obvious ways, but also in not so obvious ways; the technologies created as part of the war effort brought changes to mass communications and transport. Automobiles, highways, and television took much of the world out of the train and metro stations creating a video based advertising culture. The television era brought real life images to the forefront, while artistic images diminished. The 1950’s were the period of photo-based ads, economical, topical, but not always dynamic. Some industries still used the artistic image as its central theme – travel and tourism by train, plane and ship still understood the power of a dramatic image. The diminished role of mass transportation saw a change in the business structure of those industries. In France, it started just before the war with the consolidation of the regional rail companies into the SCNF, the French National rail system. In England, the regional rail companies went to war, never to return. The British National rail system, Britrail, consolidated the systems into one, quasi government entity. The airline and ship companies thrived for a little while longer, until the Jet Age of the 1960’s. The post war period saw most industries move to video based advertising. In the US ad campaigns were geared to that 60-second spot on a TV show, or the highway billboard, or the weekly magazine. If the automobile did one thing, it eliminated the traditional 3’ x 4’ poster as a viable art form – to small to be seen by a passing vehicle, too big for the 17” TV screen or the 11” magazine page. The poster industry suffered dramatically, but survived thanks largely to those places where man always moves by foot – the bar, the bus, the airport and the train/metro station. Today, with the rediscovery and modernization of mass transport the poster is thriving. I doubt that anyone has stood waiting for a train in the London Underground without seeing a wall of fantastic posters opposite; or walked into a train station, or through an airport without seeing poster art. Industry has discovered the power of poster art. Louis Vuitton, the highest name in fashion, is at the forefront, utilizing the talent of Razzia in promoting its products and its sponsoring activities. There is a new generation of artist and we feature several who produce in the classic fashion. These may not be vintage by age, but they remain in style, recognizing the importance of capturing a dream at a moment’s glance. turpentine, the printer then removes any excess of the greasy drawing material, but a hydrophobic molecular film of it remains tightly bonded to the surface of the stone, rejecting the gum arabic and water, but ready to accept the oily ink. When printing, the stone is kept wet with water. Naturally the water is attracted to the layer of gum and salt created by the acid wash. Printing ink based on drying oils such as linseed oil and varnish loaded with pigment is then rolled over the surface. The water repels the greasy ink but the hydrophobic areas left by the original drawing material accept it. When the hydrophobic image is loaded with ink, the stone and paper are run through a press which applies even pressure over the surface, transferring the ink to the paper and off the stone.